We’ve been talking about the wonders of Australia on the blog this week, and it’s time to focus on designer Jen Kingwell. Jen’s ability to combine color and pattern is truly unique (and that’s a word my journalism professors told me not to use unless something was truly one-of-a-kind—in this case it is.) The fabrics Jen’s designed for Moda convey that talent perfectly. There will be more to come from Jen, so keep your eyes peeled, but for now let’s catch up with her. You may remember that she spent the past couple of years living in the United Arab Emirates (UAE). 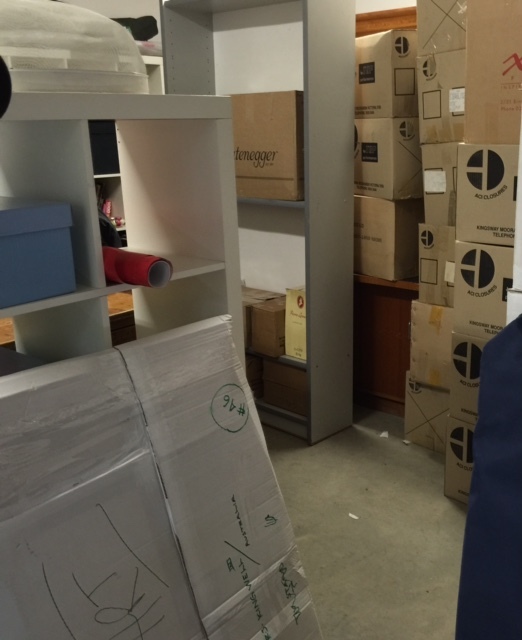 She moved back to Australia in February, and thanks to a second move is still unpacking. Thanks for stepping away from the boxes, Jen, and sharing some time with Cutting Table readers! • How has life changed since you’ve returned to Australia? Are there things you miss about the UAE? Since my return life has been incredibly busy. Like everyone, with change comes new ideas and you see things from a different perspective. When living overseas we had furnished the villa with just essentials, no clutter, and on return I realised our house was in need of a major overhaul. So big of an overhaul we decided to sell up and move……I am now officially a hoarder no longer. I enjoyed my time in the UAE but there is nothing like home and family. I missed my girls terribly while I was away. The other thing I really missed was the change of seasons. The desert looks pretty much the same summer and winter. 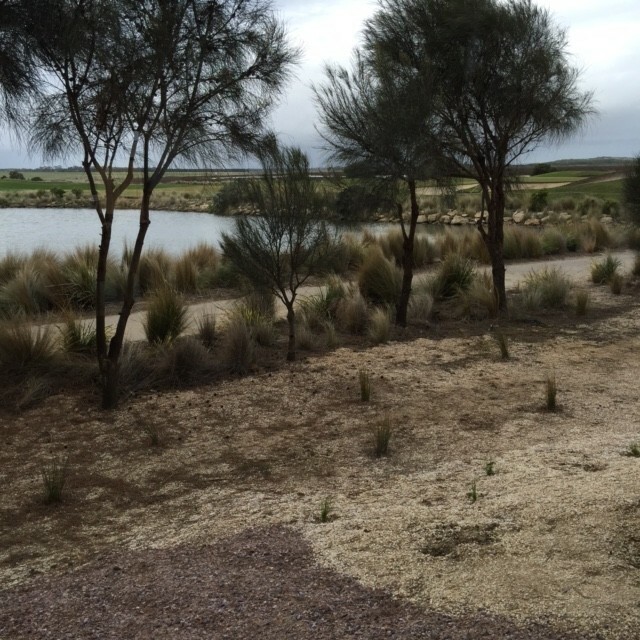 We have moved to the coast and I could sit for hours and watch the changing sky as storm fronts roll in. This is Jen’s sewing view. She says it’s worth every bit of packing, decluttering, and moving. But there are things I miss about the UAE. I was time “rich” there. We lived in a very local area. I had few distractions so plenty of time to design and sew. It was great as this was when I was writing my book Quilt Lovely. Back at home I am busy with “things.” Lovely things like friends and family, dining out, coffee with a friend, just all those normal things I missed so much. Nine-year-old Matilda (Tilda) belongs to Jen’s daughter, Meg. (Jen says this makes her Tilda’s “dogma.”) Matilda’s become an escape artist and is staying with Jen until Meg figures out her escape route. • Tell us about your new book, Quilt Lovely. What inspired it? I started writing the book soon after I arrived in the Middle East. It was a great time to do it and I think it helped me to settle and gave me a focus. I started with one idea and just worked my way through. Pat Sloan ask me in her podcast if I had a plan or theme. She giggled when I said I made one quilt, then thought about the next and moved forward, but that’s the way I like to work. I found a project on the weekend that I had started over there and when I was looking at it thought ” Oh I know what would look great,” so it’s changing as it grows. I work in a very “organic” way. I start with one idea but things change and evolve along the way. Sometimes one idea become two projects or two can meld together into one. I did try to include in the book some different techniques and looks so there was a good variety of projects to stitch. As I’m sure everyone is aware I’ve been a lover of hand stitching for a very long time and in the perfect world would hand stitch everything, but I know not everyone has my passion for this. I’m so pleased to see hand stitching becoming more popular. I love that it encourages us to slow down a little and enjoy the process. It’s portable: I stitch on planes, trains, and in automobiles! And I love that it is so sociable. Just last week I was teaching a class in New Zealand and the noise level in the room was incredible as everyone chatted and laughed. Most of these women were dedicated machine stitchers but seemed to really enjoy the “therapy” of needle, thread and a good old chat. I just love sitting and stitching. I never tire of it. I can feel my blood pressure lower as I pick up my stitching. It’s like a giant exhale. •We’ve been thinking this week about the similarities and differences between quilters from Australia and other places. Any thoughts? 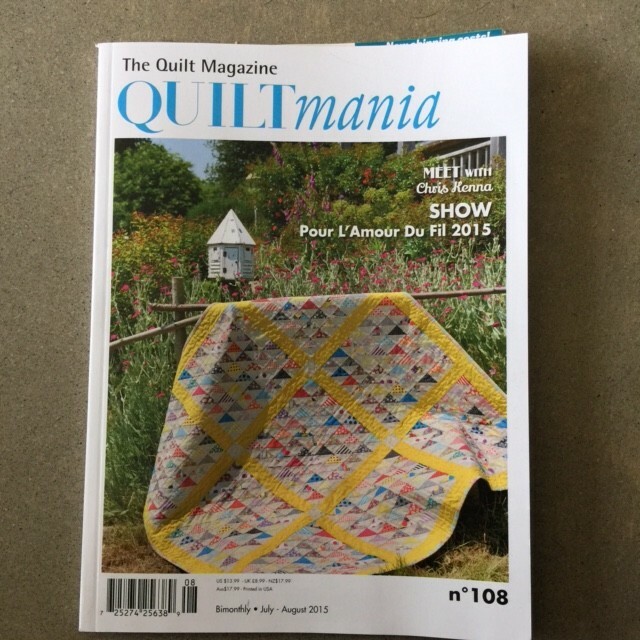 Jen’s Hip to Be Square quilt on the cover of QUILTmania. I get asked this question quite often and am not sure of the answer. We are a great melting pot of cultures, and we are a long way from the rest of the world, but we are also great travellers so we experience different countries and what they have to offer. I think our style is a lovely mixture of a lot of wonderful ideas and things from all corners of the world. We have some great designers. Our quilt stores are much smaller than in the U.S. Our population is smaller so each store seems to develop a niche style. Hand stitching is definitely popular here and has been for decades. It’s not a new thing. I don’t think we see it as “fashionable or not,” it’s more about enjoyment and passion. I smile inwardly sometimes when things become “new” again. Big stitch quilting, for example, has been around forever. I guess that’s the one good thing about being geriatric…..I’m just pleased I can still remember!!! But I can also remember coming to the U.S. many years ago and I feel that hand stitching was popular back then also. I guess things just change all the time, clever designers come up with new ways and techniques. 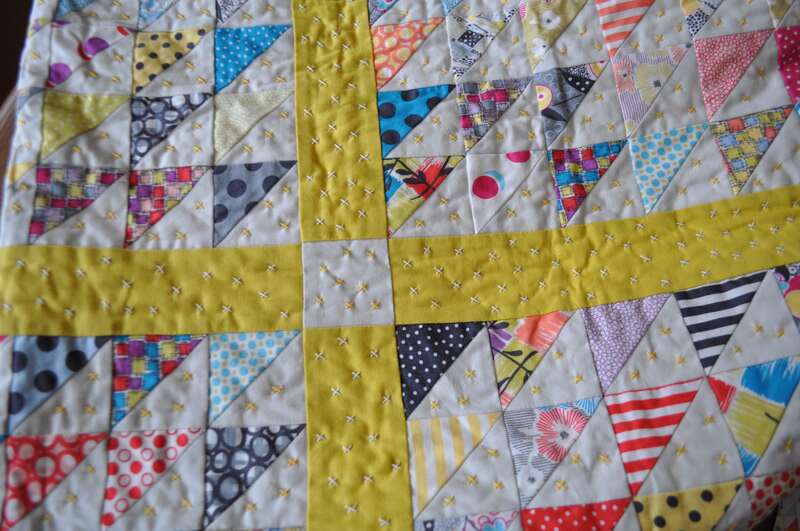 Like fashion, quilting is cyclic. Well, we’re so glad that Jen is part of that cycle and look forward to her future creations! Great interview. 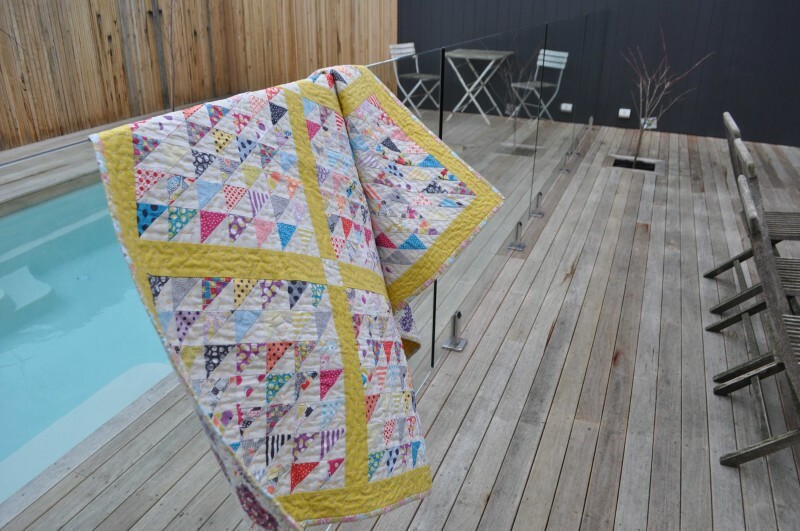 Love reading about quilters around the world. Thank you Linzee. Well done interview. Love her views on hand stitching. Just exactly how I feel. I love hand stitching, too! I feel calm and happy when I am hand stitching. I love the little cross stitch quilting on this pattern so much! Great post. Love Jen’s work. 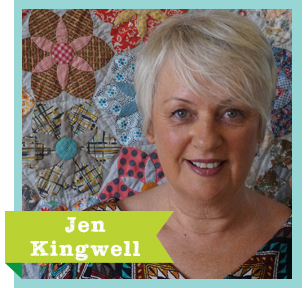 I am such an admirer of Jen Kingwell’s work. She has a stunningly unique style, and incorporates so many elements into her designs and finishes. Gypsy Wife is high on my bucket list of quilts to make, and I am thrilled to finally have been able to purchase the pattern (although I had to go to Australia online to get it! )…this winter (just as Jen heads into a lovely spring and summer “down under’. 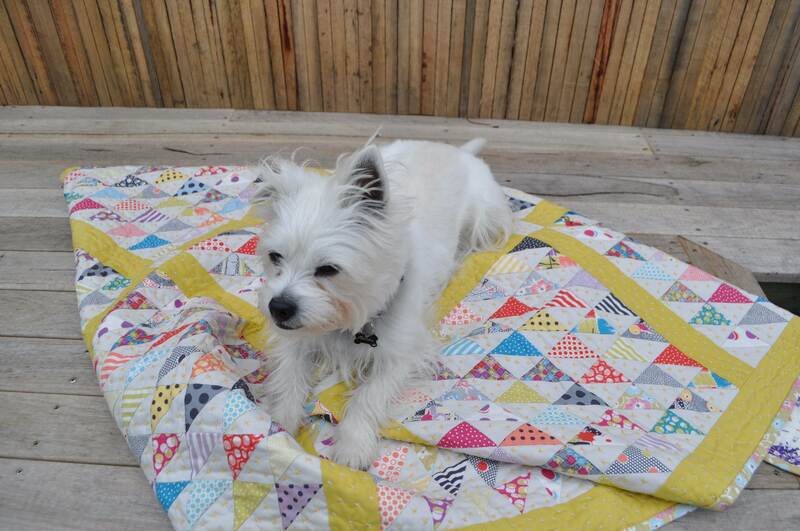 Thanks for a lovely post about this wonderfully talented designer/quilter. Loved it.